Synopsis: James Bond is sent to investigate the connection between a North Korean terrorist and a diamond mogul who is funding the development of an international space weapon. Review: With three films under his belt, Brosnan’s next venture into Bond territory was delayed slightly to coincide with the 40th anniversary of the Bond films and the 50th anniversary of the publication of author Ian Fleming’s work. Going into the release day, there was a lot of hype around the movie concerning the far-out premise and the casting of an Oscar winner as a sort of female Bond. 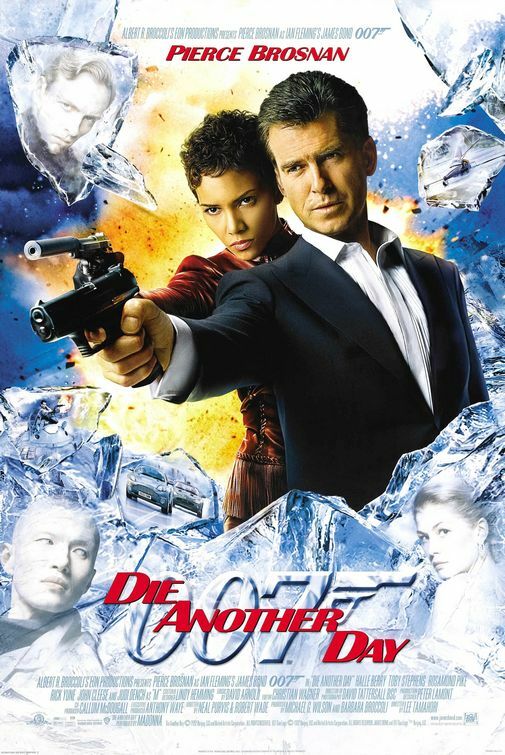 I remember seeing Die Another Day the morning it was released in Dublin, Ohio while I was on tour with a show and how much I was looking forward to it. At the time, I found the film to be overblown, overlong, and finally tipping the scales to gimmickry after avoiding it for so long. I’m not sure that I’ve seen it again until recently when I was surprised to find myself enjoying what would be Brosnan’s last time onscreen as James Bond. After a prolonged prologue set in Korea, for the first time we see Daniel Kleinman’s opening credits incorporating film elements into his design and accompanied by Madonna’s admittedly one-note but fitting theme song. (Madonna herself also becomes the first theme artist to cameo in a Bond film in a small role that nevertheless sticks out like a sore thumb). Changing up the credits was a benefit as it had to show some passage of time in a creative way. There’s a lot of mumbo jumbo in the way of a plot concerning cloning, diamonds, and a very large ice palace owned by wealthy magnate Gustav Graves (Stephens, son of Maggie Smith, who obviously inherited his mom’s way with a clipped one-liner) but it’s best not to get too involved with the more silly details happening in the film. It’s best to enjoy what the gigantic budget bought for us in the way of impressive special effects and well maneuvered stunt sequences. Brosnan is his usual dapper self, not letting a 14 month stay in a Korean prison hold his superspy back for long. Dench is tart per usual but she must have had other work at the time because her role is noticeably shorter than it was in The World is Not Enough. Pike is nicely ensconced as chilly Bond girl/MI6 agent Miranda Frost and Yune makes the most out of his underdeveloped diamond acne-d villain. If someone can explain to me why Michael Madsen shows up I’d be interested to hear! That leads us to Berry who is introduced ala Ursula Andress in the first Bond film, Dr. No. When I first saw the film I wasn’t impressed with her but over time the role has grown on me and it’s easy to see why there was buzz about her character Jinx getting her own spin-off but, alas, like Michelle Yeoh in Tomorrow Never Dies it was not meant to be. Bringing on yet another new director, the producers went with an Australian and Tamahori brings a smart sensibility to the film. He keeps the light stuff light and the full throttle action on high alert so even if the film is a little too long for its own good it still doesn’t feel like its overstaying its welcome. Some feel that Die Another Day is a lesser title in the world of 007 and even if it is…there’s a lot to like in it that would keep even the casual action moviegoer interested. Brosnan’s four Bond films are the most consistent of any of the previous Bonds so some credit should go to him for taking good care of Bond in his tenure.